La Posta de Mesilla is located in Historic Old Mesilla just two miles Southwest of Las Cruces, New Mexico, La Posta is conveniently situated on the Southeast corner of the Historic Old Mesilla Plaza. 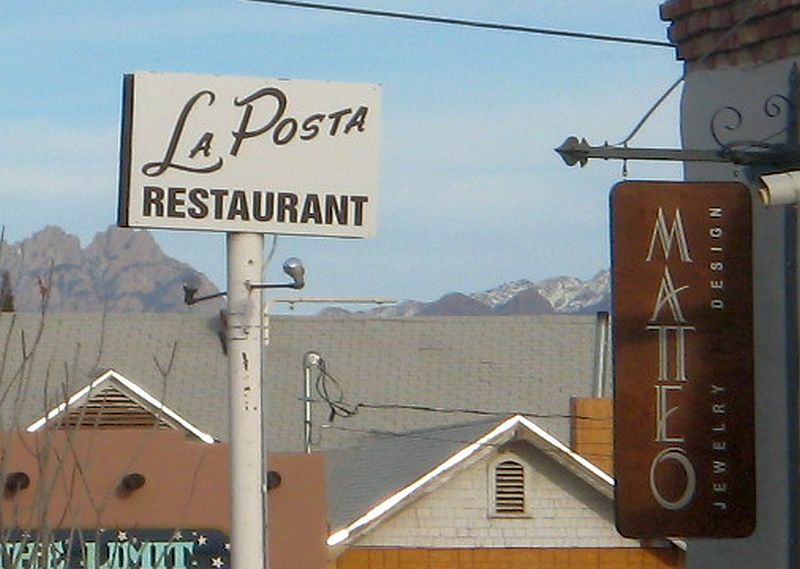 Earliest records indicate the La Posta Compound was originally constructed in the 1840’s. Sam Bean and his brother Roy Bean, operated a freight and passenger service line to Pinos Altos from this building in the 1850’s. After the Civil War, The La Posta Compound became an important stop on the Butterfield Stagecoach Line. During the 1870’s and 1880’s, the Corn Exchange Hotel, one of the finest lodges in the Southwest, operated from the building. John Davis, the proprietor of the hotel, died in the late 1870’s, however, his wife Augustina continued to operate the hotel, a restaurant and other businesses in the building until the early 1900’s. 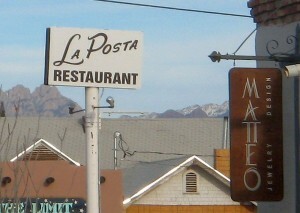 La Posta de Mesilla Restaurant originated in the northwest corner of the building in 1939 by Katy Griggs Camunez. The business has grown to become one of the most famous restaurants in the Southwest, occupying 10,000 square feet of the La Posta Compound which now included several shops. After Katy passed away, the property and business was acquired by a great niece, Jerean Camunez Hutchinson and her husband Tom, a.k.a. “Hutch”, who continue to offer the same quality food and great service in the unique dining environment Katy created. 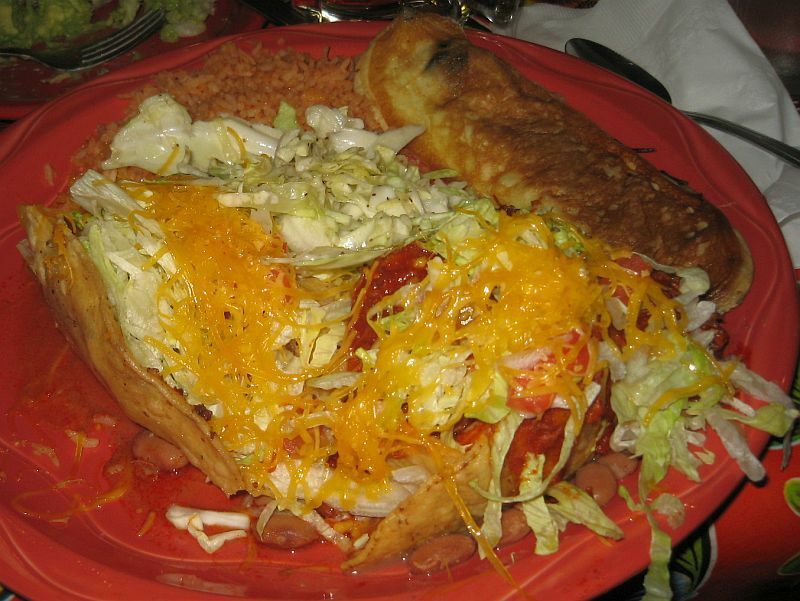 The restaurant offers many fine traditional “New Mexico” Mexican dishes make from century- old recipes handed down over the years from the Fountain, Chavez and Griggs families. One of the most famous dishes, the “Tostada Compuesta”, originated at La Posta in 1939. 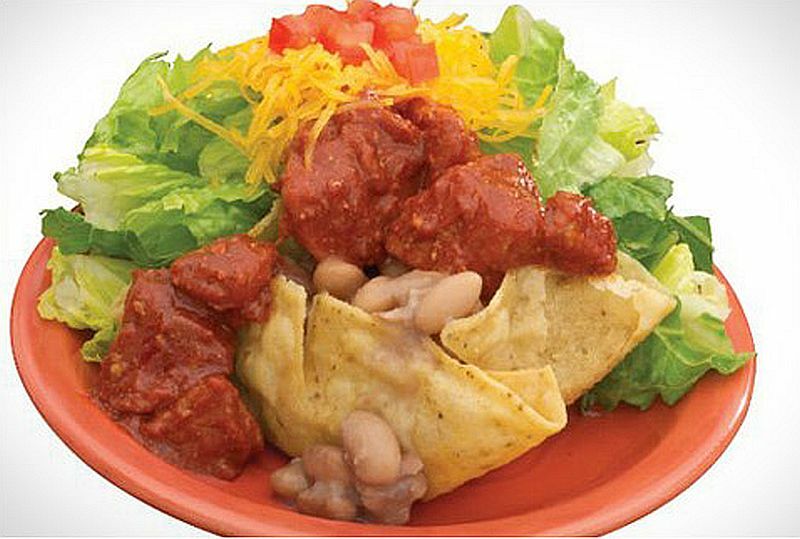 This dish consists of a toasted corn tortilla cup filled with frijoles, red chile con carne, topped with chopped lettuce, diced tomatoes and grated cheddar cheese. Our New Years Eve dinner was quite a feast. We first visited La Posta more than a decade ago, and had forgotten that the serving sizes are huge. We ordered a lot of food. 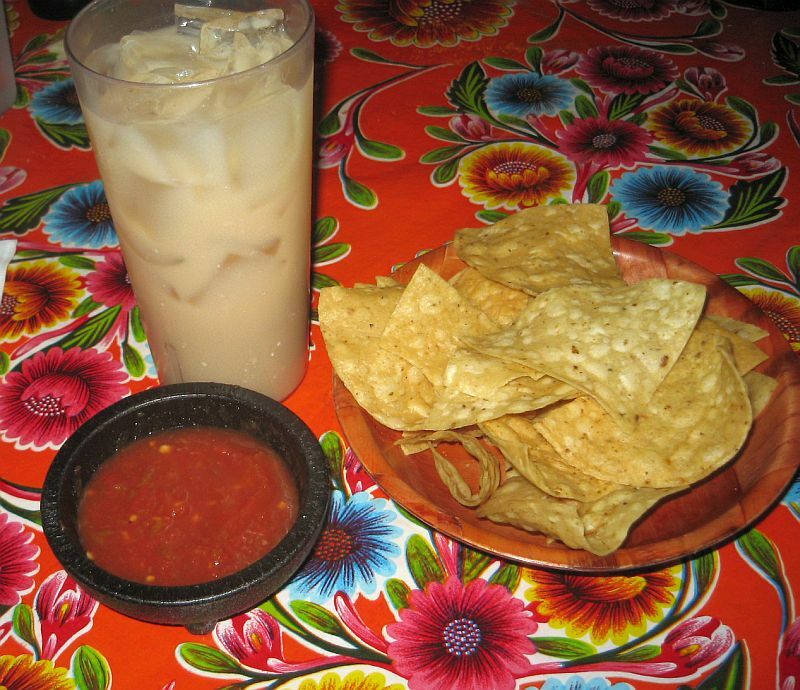 starting with chips and salsa, and I added a tumbler of horchata. The chips were fresh, warm, and lightly salted. The salsa, tomato based, was very tasty and fresh, and of medium piquancy. Delicious starter to whet our appetites. Horchata is the name of several kinds of traditional beverages, made of ground almonds, sesame seeds, rice, barley, or tigernuts (chufas). Various folk etymologies exist – one legend links the origins of the name to James I of Aragon, who after being given the drink for the first time by a local in Alboraia, was said to have exclaimed “Açò és or, xata!” (“That’s gold, darling!”). The version at La Posta is the vest I can remember having — That’s Gold. Kerry and Matt stuck with Combo Plates, which they had had before. COMBINATION PLATE #1 has Rolled red enchilada, tamale, red chile con carne, rolled taco, frijoles, rice and garnish while COMBINATION PLATE #2 – has Rolled red enchilada, red chile con carne, two rolled tacos, frijoles, rice and garnish. Both are very tasty. 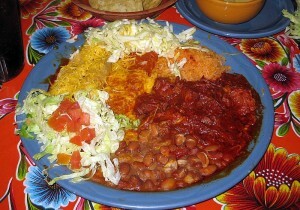 Even the beans and rice are good, which is often not the case in many New mexican restaurants. Jane chose the CHILE RELLENOS – Two whole green chiles filled with Monterey jack cheese, dipped in whipped egg white batter and cooked on the griddle till golden brown. Served with refritos, rice and garnish with special chile cheese garnish. Rellenos are one of her faves, and she was not disappointed with those served here. Both the taste and texture are excellent. Almost as good as those she would get at Marlene’s New Mexican Restaurant, one of our early favorites when we moved to New Mexico 3½ years ago. I have developed a love of Carne Adovada. 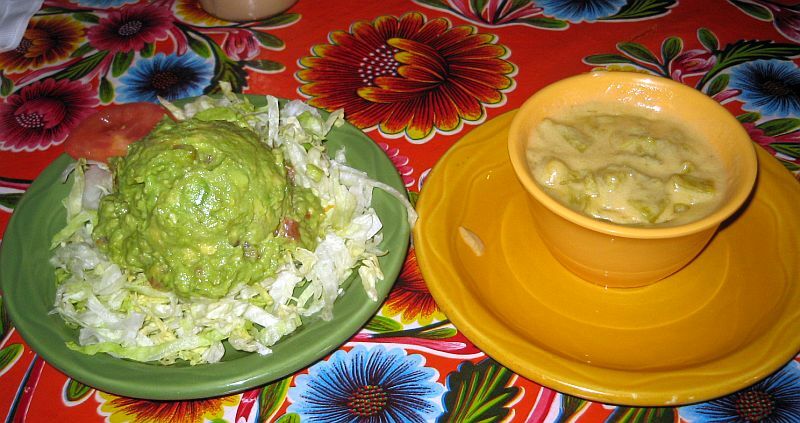 The menu touts BANQUETTE ELEGANTE – “A dinner of gourmet foods” – this one will be long remembered.” Starter of chile con queso, corn tortillas and guacamole salad. Your entree includes carne adobada, camotes Jalisco, refritos, rice and a sopaipilla. The camotes (baked sweet potato fries) were MIA, but no matter — there is too much on the plate to finish. The Guacamole and Chile Con Queso are both excwllent. But you need to restrain yourself lest you fill up before you tackle the main plate. Aah. 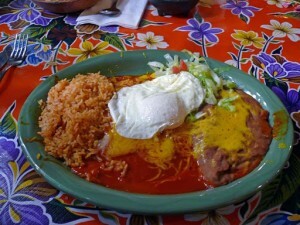 The Carne Adovada. Nearly every New Mexican restaurant makes a version of Carne Adovada. Few make as well as La Posta. I use this wonderful dish as a benchmark, and Pa Posta passes with flying colors. 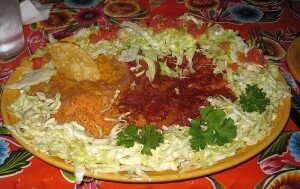 The huge portion of carne is surrounded by Mexican rice and frijoles refritos with a border od Lettuce and parsley garnish. The poek (random 0size chunks) is fabulous. It has the right texture — succulent, tender, and not at all stringy. The red chile is dark, complex, and of slightly more that medium piquancy. This is among the top ten Adovadas I have had in New Mexico (and I have had lots). A basket of Sopaipillas appeared as we were finishing our entrées. To say that they are excellent might be an understatement. Pillowy, puffy, and perfect. 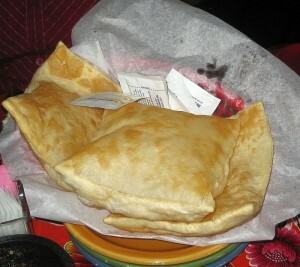 I didn’t finish the rice and beans, because I knew that La Posta is known for their dessert empanadas. 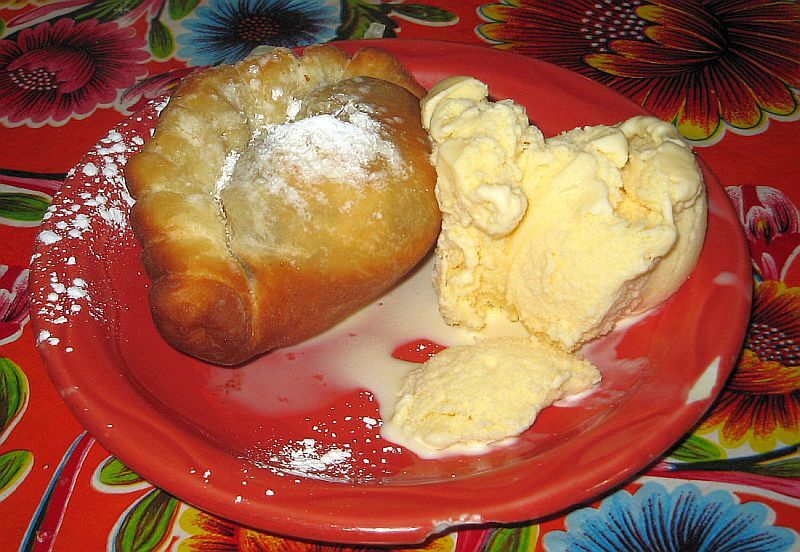 Apple, cherry, apricot or mincemeat turnover served hot with ice cream. I, being in a festive mood, chose the mincemeat, and diet be damned. This beauty is incredibly delicious. Sweet, rich, and thoroughly decadent. Pray for my waistline. A perfect way to finish off a fabulous meal. Many Urbanspoon reviewers claim that La Posta is too touristy, and dismiss it. Well, there were locals, their guests, and yes-some tourists eating there. Tourists have to eat someplace, and this is a wise choice because the food can be excellent. The service certainly is. To me, an objectionably touristy restaurant is one that serves mediocre food to hordes of people who are attending a business convention or taking a bus tour. Like El Pinto or Sadies in Albuquerque. La Posta is the real thing. 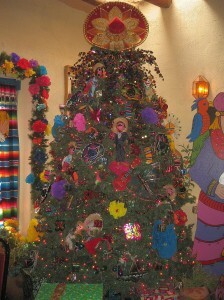 La Posta was clad in its Christmas finery when we last visited. 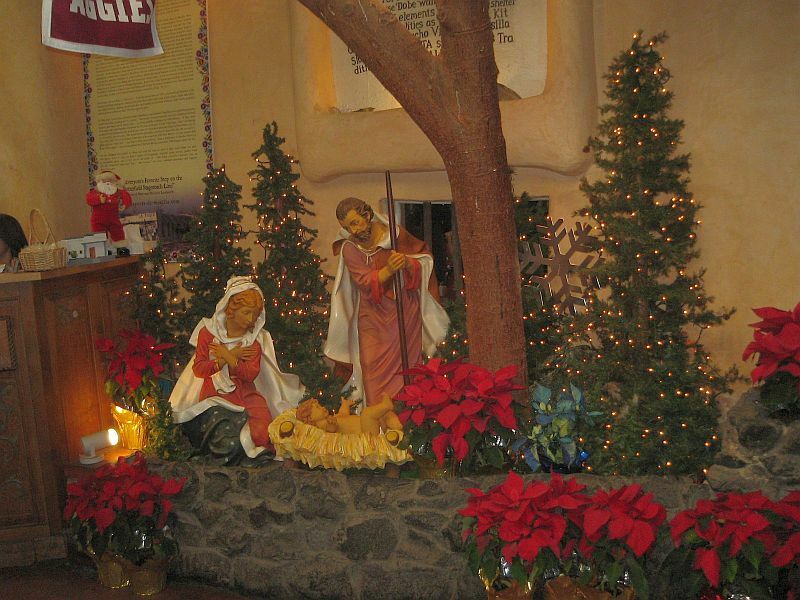 “When Richard and I entered, we were struck by the colorful restaurant decorations (including the colorful holiday decor) as well as the festive atmosphere. Locals, tourists, and large holiday get-to-gethers were all being efficiently served by a friendly and competent wait staff. The restaurant itself is a maze of multiple rooms and dining areas, which I think just adds to the charm. This entry was posted in Las Cruces, New Mexican. Bookmark the permalink. 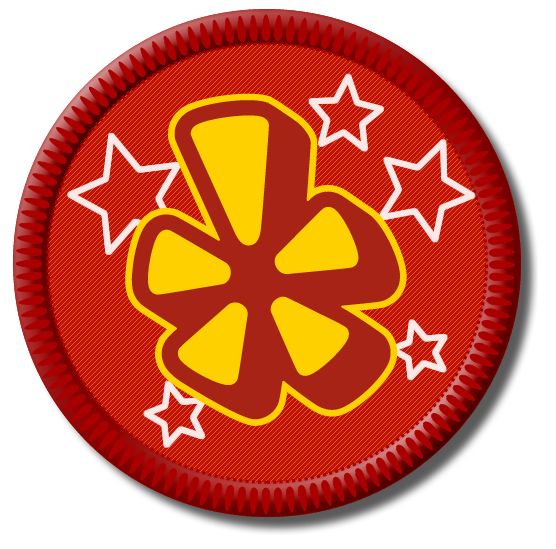 Like you, I’ve enjoyed La Posta very much but also have not had good dining experiences at El Pinto. Any idea what accounts for the differences? I can venture a guess. El Pinto has gotten too big and spends lots of time and resources to their product development and sales. Thr restaurant is huge, the service is slow, and the food is mediocre. La Posta, on the other hand, pays attention to the food and the service, and the house is quite beautiful. The recipes may share a common genesis, but the evolution has favored La Posta. I would go there anytime. The experience was a total delight. Can’t say that for El Pinto, to which I shan’t return. I recently visited family in New Mexico and had the delight of eating Flan at your restaurant. The food was delicious but this was the first time I had experienced Flan and knew I would have to try to make it myself! I tried a recipe online but it wasn’t as pretty or sweet as yours. Do you share recipes? Would love to share this with my family in Alabama! Thank you so much!